Random Noodling: Yet Another September Announcement! 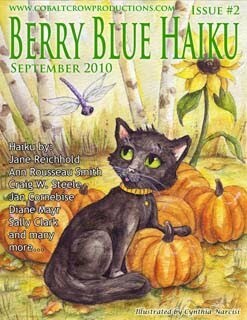 The new issue of the children's haiku magazine, Berry Blue Haiku, is now available. I'm happy to say I have two haiku in this issue! For more information, click here. Congrats, Diane! You're on a roll! It hope it's a nice crusty one with a big smear of unsalted butter! Thanks! Congratulations! I had never heard of that magazine before. Congratulations! That looks like a wonderful magazine.